There’s something nostalgic about parquet flooring. The word “parquet” dates back to 17th century France, where Parquet flooring became the floors of choice, installed in palaces throughout Europe. They are still known today for their ability to bring an old-world, distinguished charm to any space. Parquet is a decorative pattern that consists of wood strips arranged in geometric patterns such as a triangle or a square. The herringbone pattern is still one of the most popular choices. And it’s one of the most popular choices you’ll find to maintain historic, old-world charm in houses all across the Front Range. Gluing down the parquet tiles is the most crucial part of the installation process. Because parquet flooring is patterned, one wrong angle can through the entire floor off. The flooring must be properly acclimated and the moisture content in the sublfoor must be acceptable for installation. Once at the proper levels, you can glue parquet on either plywood or a concrete subfloor. If using a concrete floor as the subfloor, you may wish to consider a vapor-retarding subfloor to prevent extra moisture from seeing into the floor. Be especial diligent about checking moisture content on different areas of the concrete. Never lay parquet on a concrete slab that hasn’t had at least six months to settle. When laying parquet flooring, it’s important to work in small sections so the adhesive doesn’t dry before the tiles are set in place. As the tiles are laid into place, gently lock in the tongue and grooves of the planks. 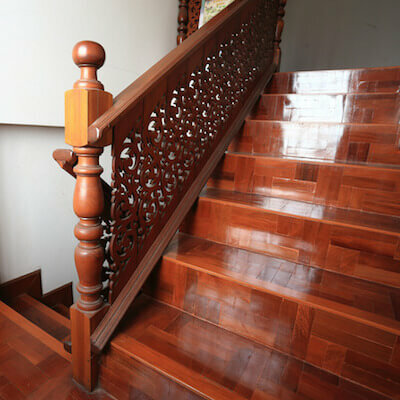 Once in place, parquet flooring can give you years of enjoyment. They can be sanded and stained as needed. Have additional questions about installing parquet flooring in your home?